How to Judge a Horoscope is a departure from the conventional method of treatment of astrology. It is a study in the use of Horoscope in every man's daily life. The work in two volumes is divided in twelve houses, containing six each in consecutive order. The twelve houses have reference to the material relation of soul (jeeva) in its journey from the cradle to the grave. The study of illustrations (charts) makes everypoint - even the omitted rudimentary principles and rules - very clear and graspable. Volume 1 deals with houses I to VI. First House deals with the beginning of life, childhood, health, physical body and character. Second House presents family, face, right eye, food, manners and source of death. Third House rules brothers and sisters, intelligence and other immediate relations. Fourth House indicates peace of mind, home life, land and ancestral properties, education, neck and shoulders. Fifth House indicates children, intelligence, emotion and fame. Sixth House rules over debts, enemies, miseries, sorrows, illness and disappointments. Dr. B.V. Raman was the Chief Editor of The Astrological Magazine founded in 1895 and written many books on Astrology. "The matchless analytical skill and the deep erudition of the author comes into full focus in the first book as he seeks to unfold voluminous details on the predictive aspects in relation to the Houses...illustrated with over 250 charts." - R. Parthasarathy, The Hindu, October 5, 1993. All my astrological books-both predictive and mathematical- have been received favourably-in fact beyond my own expectation-both by the public and the press. This has encouraged me to bring new books dealing with important aspects of astrology. The present work, which I have the pleasure to submit herewith, makes a departure from the conventional method of treatment of astrology. I have dealt with each Bhava or house exhaustively with suitable illustrations. There can therefore be no question as to the importance of this new work. Nothing is more difficult in the present state of our knowledge than to say in what events and Circumstances any given combination will express itself. For example, such a combination as Saturn and the Sun, rising in the ascendant, may result in a fall, disease, loss of status or money; it might indicate a temperamental defect, an intellectual inhibition or it may operate in several other ways. An attempt has been made in the following pages to ascertain the indications of the various influences with reference to each house. In the sphere of astrology too, a study of practical horoscopes is absolutely necessary to grasp the true worth of the subject and handle its technique properly. 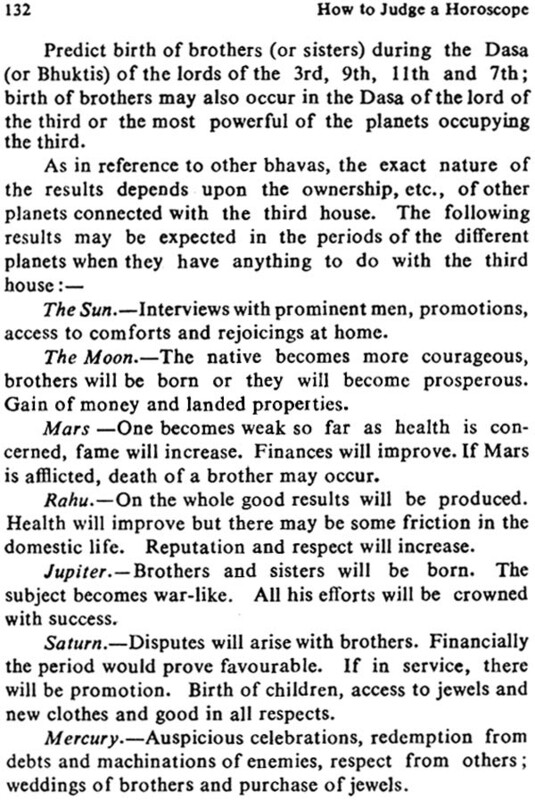 In writing HOW TO JUDGE A HOROSCOPE, this aim has been kept in view. Typical examples, illustrative, of important principles, have been selected from actual lives. 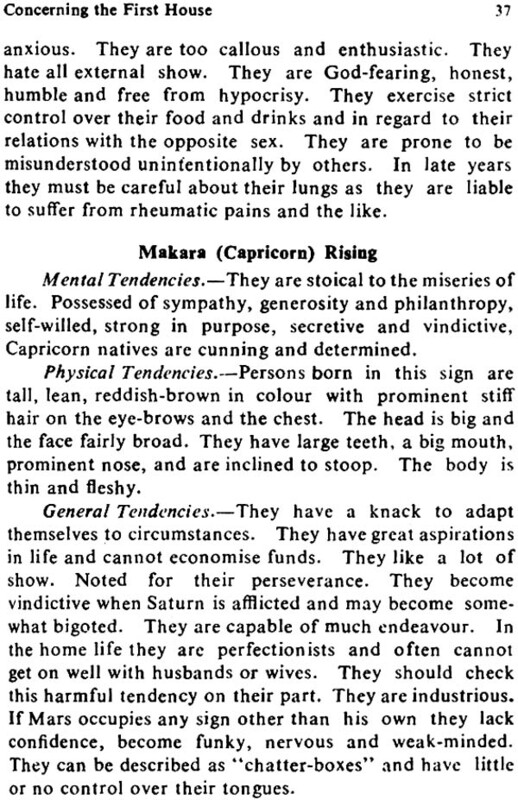 A careful study of these examples will certainly give a sound and working knowledge of astrology. 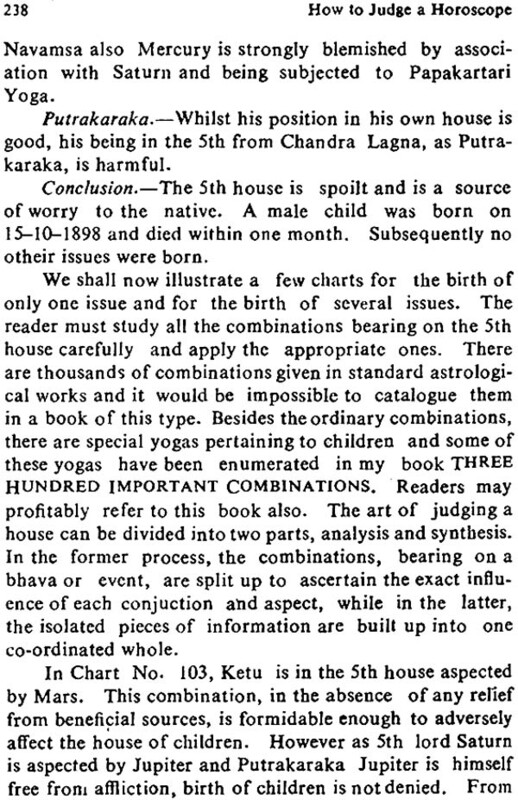 In the analysis of the Bhavas (houses) I have omitted to take -into account the various yogas as I have dealt with them in detail in my Three Hundred Important Combinations. 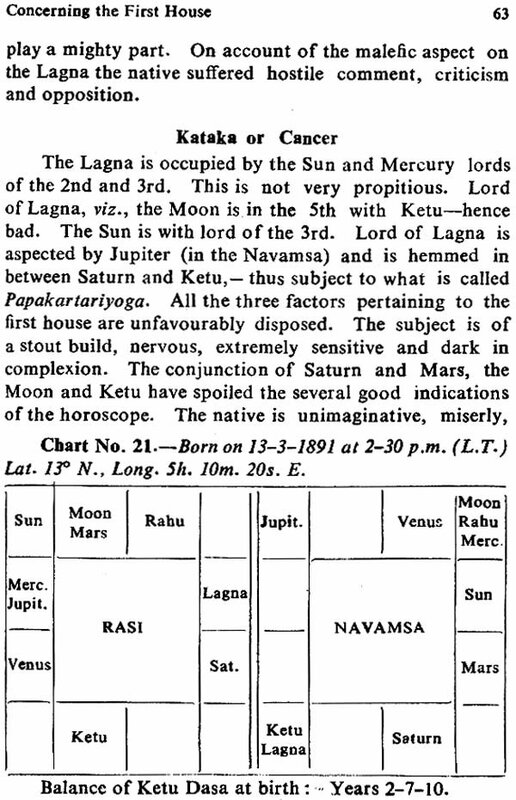 Most of the rules given in ancient Hindu astrological books can be readily tested if we can only secure sufficient data beyond dispute. To reject them off-hand as unsuitable is to betray our ignorance. In my extensive travels throughout India, I have had discussions with several well-known scientists and scholars. Most of them are convinced that astrology has a rational basis but they hesitate to proclaim their faith in public just because the orthodox scientist has not yet put his stamp of approval on astrology. 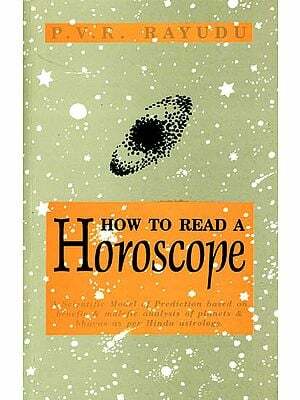 In this book, I am not going to make a case for astrology. 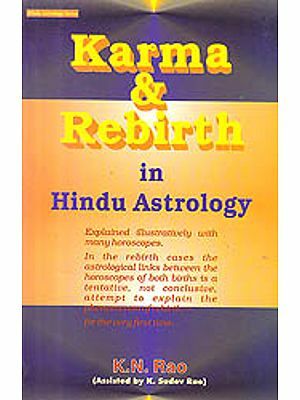 The introduction I have given to my Astrology for Beginners and my Astrology and Modern Thought should be eye-openers to the greatest sceptic, that astrology is science and no superstition. It is an interplanetary or cosmic science that deals with the play of cosmic energy. If modern science has not yet discovered by the limited means at its disposal that man is subject to the influences of planets on the three planes of existence, viz., physical, mental and moral, then it is certainly no fault of astrology. The ancient Maharishis who have propounded the rules of astrology were sages of a high psychic development and examined terrestrial and celestial phenomena by their divine sight or Divya Drishtt. We would hardly be justified in attributing mean motives to those sages who have left great names in the landmarks of time. They saw many phenomena which the so-called scientist could hardly hope to see with his instruments. Our minds are mean and are almost exclusively engaged in studying and procuring worldly comforts. Though at the height of yogic development, they scorned to utilise such know- ledge for any worldly concerns, and soley used it for the benefit of mankind. Can a science as astrology be ever untrue? The scientist takes too crudely a materialistic view of the whole nature of the universe. He contends that he may think of considering astrology as a fit subject for investigation provided the destiny factor is ruled out of it. This is simply absurd. 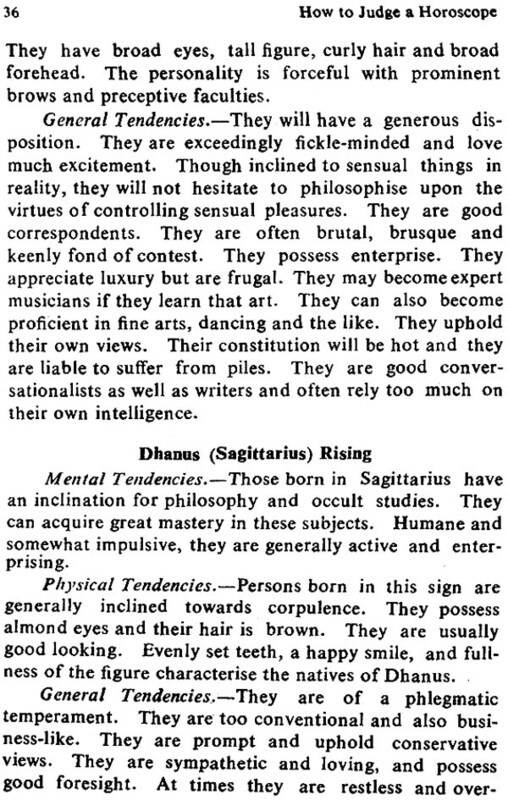 There is nothing like destiny in astrology. The proper term to be used is Adrishta or that which is not seen. 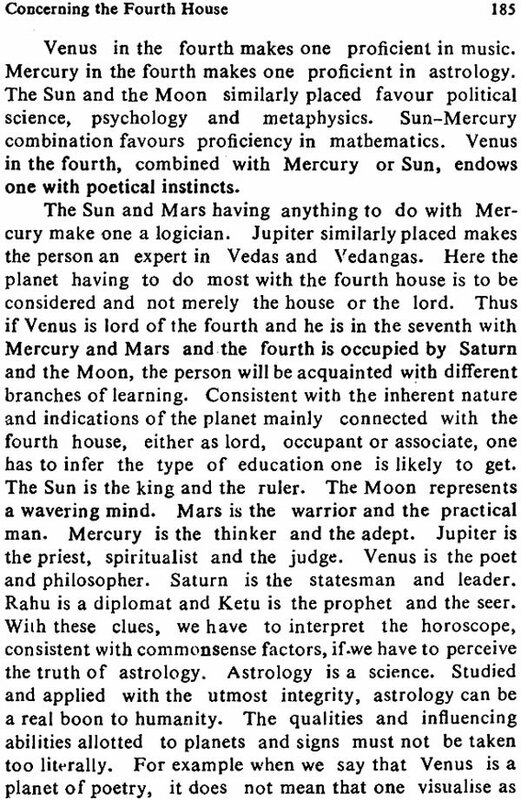 Astrology simply indicates and gives the greatest scope for the development of will-power, by means of which one can either counteract the evil indications or augment the favourable influences. I feel sure that I have supplied a long-felt want by ushering In this publication for the benefit .of the educated public. In the study of astrology nothing is more important, more difficult and more taxing than the proper judgment of a horoscope. 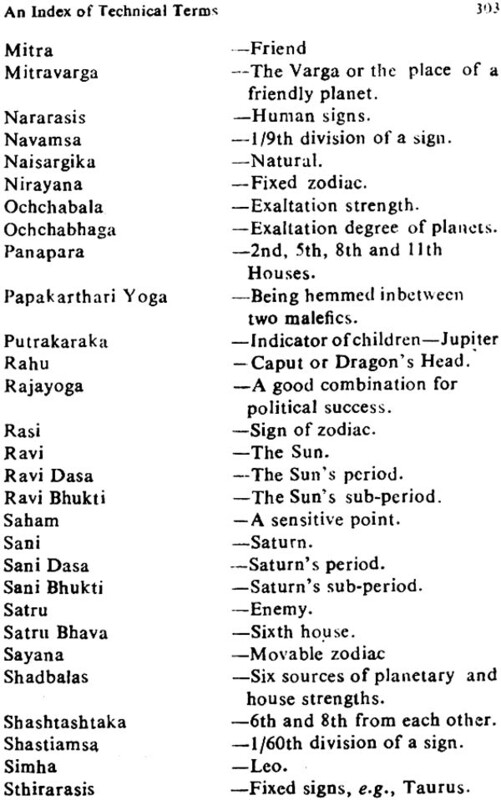 The twelve Bhavas or houses represent the entire history of the individual. 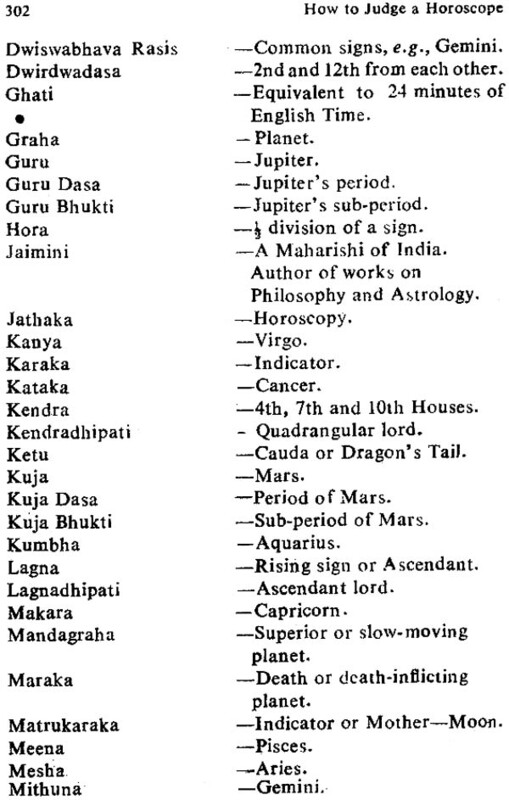 In order to analyse a horoscope properly and thoroughly each house or Bhava should be carefully scrutinised. Sometimes it so happens that many of the principles of astrology given in even standard works do not hold good in actual charts. In such circumstances, conclusion should not be drawn that the principles of astrology are contradictory. On the other hand, a further analysis of the relations and interrelations of planets should be made. Astrology is the most difficult of all sciences. It is neither a physical science in the sense that physics or chemistry is; nor is it metaphysical. The precision of mathematics should be harmoniously combined with the intuitive capacity of a philosopher. Consequently no hard and fast rules can be laid down for guidance, except the broad principles. In order to examine a horoscope a good deal of judgment is required. 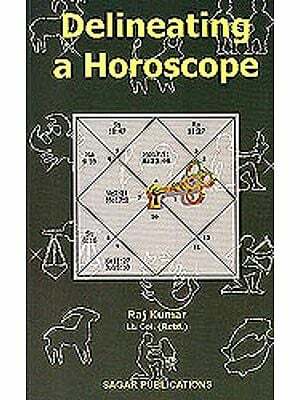 In this book, it is proposed to deal with the twelve houses in an exhaustive manner and introduce to the reader, principles of astrology with which he may not have come across. One cannot say with any definiteness why particular events of human life are attributed to particular houses in a horoscope. For instance, the first house represents the body while the fourth rules the mother. The rationale of this allocation is still a mystery. The ancient Maharishis must have had in view some scientific basis for the allocation of all the events of human life to the twelve Bhavas or houses. It must be noted that the twelve houses have reference to the material relation of Jeeva (soul) in its journey from the cradle to the grave. According to one explanation, the ancient Hindu day was divided into twelve sections of five ghatis each and each section was devoted to certain definite duties of the daily routine of living. The day started just about, or a few ghatis (5 ghatis) before sunrise. From this time until sunrise the activities were purely personal. Hence the first house became the personal house. This ingenious explanation does not certainly gratify the curiosity of thinking brains. As the birth gives rise to all the incidents and results to be experienced in our terrestrial life, the ascendant or Lagna, which is their significator, points to the conditions of life on earth. 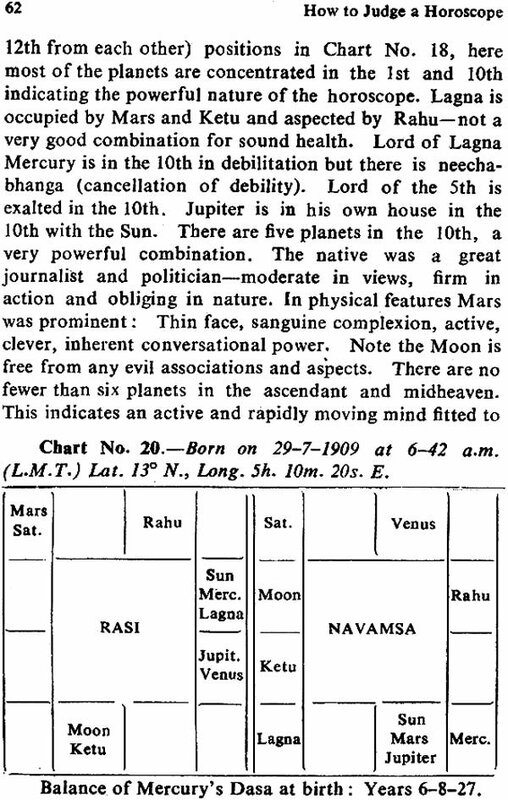 The second half of the day (amongst ancient Hindus) commenced with the seventh period of five ghatis (after the setting in of evening). This period was always a period of amusement and relaxation-of meeting partners and enjoying the pleasure of contact. Hence the 7th house came to be associated with wife and partner. The house opposite the ascendant must be one with which to form a pair and therefore the seventh house is attributed to wife. In the zodiac, Aries is the first house. The third house is Gemini. It represents arms. As arms protect our body so also our brothers are our helpers in the earthly life and hence the third house in general indicates brothers. The fourth house rules breasts. It is from the breast that the baby suckles its nourishment while happiness and pleasure proceed from the mind. It is not our purpose to try to explain the rationale of the attributes of the twelve houses. On the other hand we have suggested above that common-sense thinking enables one to appreciate what this rationale is. Take a haroscope in which the fifth house is afflicted by unfavourable conjunctions and aspects. The subject will have no children or all or most of his children will die. Will this not suffice to prove that the fifth house is connected with children? The ancient Maharishis discovered grand and glorious truths with the aid of Divya Drishti or introspection. 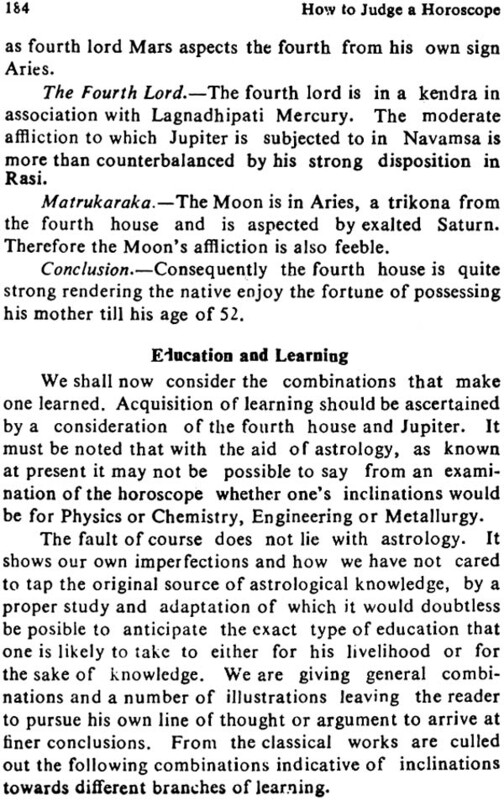 In applying the rules contained in astrological books to practical horoscopes one must definitely bear in mind that they are merely for his guidance. In addition to knowledge of astrology, one must also exercise discretion and common-sense coupled of course with a certain amount of intuition. Significations have been assigned to the various dignities and debilities of planets, the pros and cons of which must be carefully considered. No prediction should be given in a haphazard manner. If the fifth house is well disposed, and its lord occupies favourable situations the subject will be happy with regard to children. 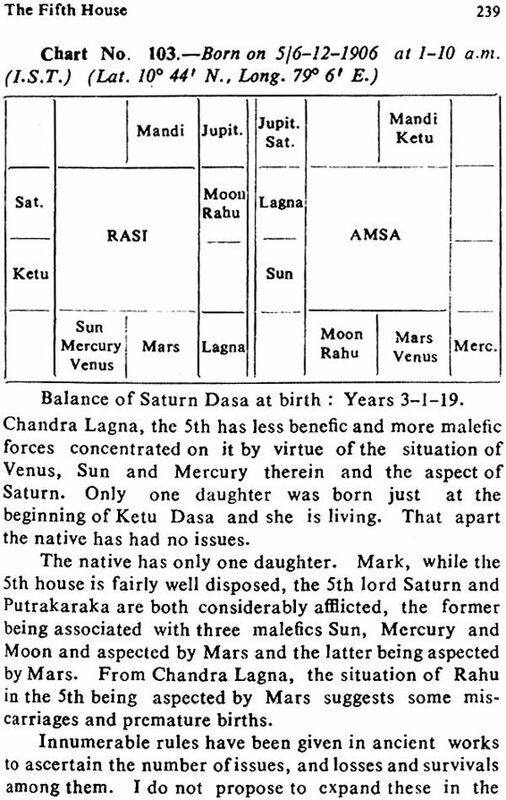 Supposing Pisces is Lagna and Jupiter is in Cancer the fifth or suppose Kanya is Lagna and Jupiter is in Makara. Would the results in either case be the same? 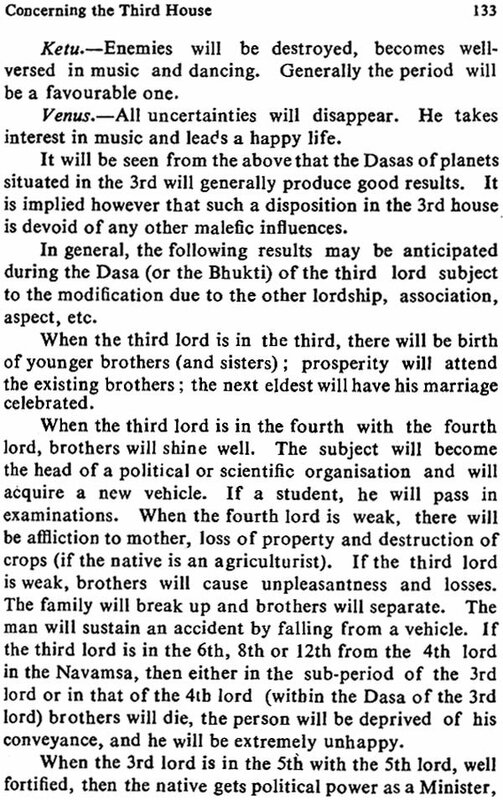 In the first instance, Jupiter lord of Lagna is in the 5th exalted: In the second case, Jupiter lord of 4th is in debilitation. Can the results be same in both instance')? Common-sense tells us that the results must differ. An astrological student must bear in mind all these differences and venture a prediction. The First house is called Thanu Bhava. It deals with or represents the beginning of life, childhood, health, environment, personality, the physical body and character. The Second house represents family, face, right eye, food, wealth, literary gift, and manner and source of death, self-acquisition and optimism. The Third house rules brothers and sisters, intelligence, cousins and other immediate relations. The Fourth house indicates peace of mind, home life, mother, conveyances, house property, landed and ancestral properties, education and neck and shoulders. The Fifth house indicates children, grandfather intelligence, emotions and fame. The Sixth house rules over debts, diseases, enemies, miseries, sorrows, illness and disappointments. The Seventh represents wife, husband, marriage, urinary organs, marital happiness, sexual diseases, business partner, diplomacy, talent, energies and general happiness. The Eighth indicates longevity, legacies and gifts and unearned wealth, cause of death, disgrace, degradation and details pertaining to death. The Ninth rules father, righteousness, preceptor, grandchildren, intuition, religion, sympathy, fame, charities, leadership, journeys and communications with spirits. The Tenth indicates, occupation, profession, temporal honours, foreign travels, self-respect, knowledge and dignity and means of livelihood. The Eleventh represents means of gains; elder brother and freedom from misery. The Twelfth rules losses; expenditure, waste, extravagance, sympathy, divine knowledge, Moksha and the state after death.